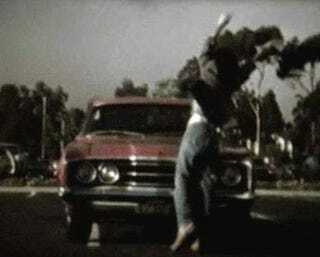 Adventures In Super 8: Mercury Cyclone Assassination! You've seen me siphoning gas for my '68 Cyclone (which made an excellent pizza delivery vehicle), and now we've dug up some more old Cyclone film from the Murilee Super 8 Archives. All I remember about this sequence was that it was done for an Intro To Screenwriting class that required the students to work in groups, and one dude in my group refused to participate in any project that didn't involve (1) guns and (2) gallons of fake blood. I can't find the film with the gallons-o-blood gushing down the grille of my car, but I'm sure it was pretty cool.